Published in Khimiya Prirodnykh Soedinenii, No. 2, March–April, 2019, pp. 272–274. 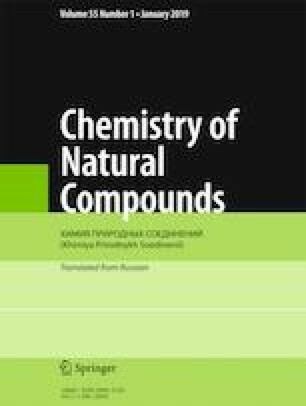 This research was sponsored by the Project of Discovery, Evaluation and Transformation of Active Natural Compounds, Strategic Biological Resources Service Network Programme of Chinese Academy of Sciences (ZSTH-027), the Youth Innovation Promotion Association of Chinese Academy of Sciences (2017471) and the Significant Science & Technological Project of Qinghai Province (2014-GX-A3A).